The battle of wits has begun! One of the largest museums in the country, a rich American history, blah blah blah. Most importantly: the steps out front are the ones Sylvester Stallone famously runs up in the Rocky franchise. To complete your Philly experience you must imitate his victorious ascent with all the other tourists. If you feel like checking out the art afterwards, we have a few suggestions. The Philadelphia Museum of Art is an art museum originally chartered in 1876 for the Centennial Exposition in Philadelphia. The main museum building was completed in 1928 on Fairmount, a hill located at the northwest end of the Benjamin Franklin Parkway at Eakins Oval. The museum administers collections containing over 240,000 objects including major holdings of European, American and Asian origin. The various classes of artwork include sculpture, paintings, prints, drawings, photographs, armor, and decorative arts. 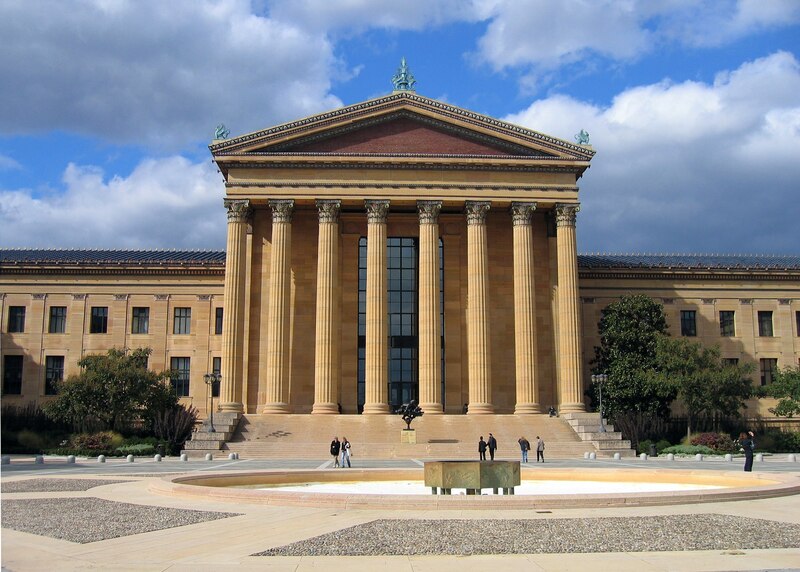 The Philadelphia Museum of Art administers several annexes including the Rodin Museum, also located on the Benjamin Franklin Parkway, and the Ruth and Raymond G. Perelman Building, which is located across the street just north of the main building. The Perelman Building, which opened in 2007, houses more than 150,000 prints, drawings and photographs, along with 30,000 costume and textile pieces, and over 1,000 modern and contemporary design objects including furniture, ceramics and glasswork. The museum also administers the historic colonial-era houses of Mount Pleasant and Cedar Grove, both located in Fairmount Park. The main museum building and its annexes are owned by the City of Philadelphia and administered by a registered nonprofit corporation. Several special exhibitions are held in the museum every year, including touring exhibitions arranged with other museums in the United States and abroad. The attendance figure for the museum was 793,000 in 2017, which ranks it among the top one hundred most-visited art museums in the world. The museum is also one of the largest art museums in the world based on gallery space. Check out the full Wikipedia article about Philadelphia Museum of Art.